From that point on, Dino becomes increasingly obsessed with Cecilia. Rather than loving her it is as if he wishes to possess her, not simply in a physical sense but in obtaining an understanding of her superior to her own self-awareness. This explains his endless questioning, and his irritation with Cecilia’s vague replies. This is, of course, simply not possible and he becomes increasingly frustrated. He cannot because “in reality I had at that moment only one relationship… with any object of any kind, and that was my relationship with Cecilia.” In his attempt to convince himself of Cecilia’s reality (or rather, to make Cecilia convince him) in order to assuage his boredom, he fails to see that it is caused by his own inability to look beyond himself. The novel works perfectly as a monologue because that is how Dino sees his life. Even when questioning Cecilia about herself he is searching only for the answers that will satisfy him. Once again Moravia shows himself the master at portraying the deluded male who thinks he can understand the heart of a woman using his superior intelligence as a collector might use a pin on a butterfly. 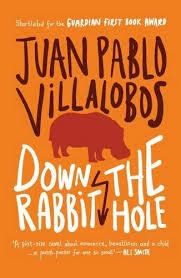 Tochtli, the child narrator of Juan Pablo Villalobos’ debut novel Down the Rabbit Hole, wants for nothing. Even when he decides the must-have pet is an all but extinct Liberian pygmy hippopotamus, his dreams do not exceed the possibilities of his rarefied life in the luxury hideout of his father, who is clearly something important in drugs and violence. The title’s reference to Alice in Wonderland suggests the alternate reality within which he lives with a surfeit of possessions but a lack of people (including a mother): he claims to know only thirteen or fourteen, including his father, Yolcaut, and his tutor Mazatzin. The animals the pygmy hippos will join include a lion and two tigers, kept for more practical reasons – to dispose of the corpses. Despite this, we retain sympathy for Tochtli, so clearly a victim of his upbringing, while at the same time we are aware that this coming-of-age novel is one in which the narrator’s maturity relates only to the world of his father. Villalobos recreates the violent scenes Tochtli sees portrayed on television in miniature in his own life, for example when, having stolen a small pistol, he shoots one of the lovebirds they keep as pets. When he does finally acquire the pygmy hippos he does so in such a way as to symbolise his acceptance of his inheritance. Down the Rabbit Hole is a wonderful example of the child narrator: it does everything you could possibly hope for in such a slim volume. Tochtli remains a credible creation throughout, and Villalobos uses his childish enthusiasms to both illustrate the society he lives in and demonstrate the development of his character. That this is so perfectly conveyed in the novel’s voice must also be due to the excellent work of the translator, Rosalind Harvey. This is one of a number of short novels I have read recently which demonstrate that the power of literature is not measured in pages. While complaining about the frequently inadequate and imperfect democracy of the UK, it is easy to forget that for most of the human race politics is experienced via a series of interchangeable dictatorships. As Western Europe (more slowly than we like to recall) exorcised such totalitarian leaders in the aftermath of World War Two, the cruellest and most flamboyant tyrannies were often to be found in Latin America, a continent which for a while became synonymous with dictatorship. The story goes that two Latin American writers, Carlos Fuentes and Mario Vargas Llosa, felt a fictional reaction to this was imperative and invited a number of other writers to contribute novellas on the theme to an anthology. Although this ultimately proved impossible to coordinate, three of the writers went on to write full length novels on the subject: Gabriel Garcia Marquez (The Autumn of the Patriarch); Augusto Roa Bastos (I, the Supreme); and Alejo Carpentier (Reasons of State). (I believe the Vargas Llosa story ‘The Cubs’ also arose from this project). Recently I discussed Fuentes’ already diminishing fame in the English-speaking world, but Carpentier is a writer whose literary renown outside of his own continent (though born in Europe, he regarded himself as Cuban) was only sporadic in the first place despite his association with the development of magical realism. Reasons of State, published in 1974 and almost immediately translated in to English by Frances Partridge in 1976, has long been out of print – until, that is, the intervention of Melville House last year. Interestingly, Carpentier also changes from first to third person at this point (the telegram is the dividing line) allowing him to use the phrase “the Dictator” in the final sentence of the chapter. The first person is how the Dictator wants to be seen; the third person represents him as he is. Carpentier does not skimp on his portrayal of the Dictator; at this point we are merely one third of the way through the novel. We will follow out protagonist right to the end. Carpentier is lavish with his detail and seems particularly intent to contrast Paris with the Dictator’s homeland. Chapters are generally prefaced by a quotation from Descartes, and (as hinted at in the title) there seems to be a dichotomy between the enlightened reason of Europe (which the Dictator insists he admires) and the superstitions of the tropics – the Dictator blames the first rebellion on the fact that the prostitute he slept with the previous night was dressed as a nun. Reasons of State is a wonderful addition to the literature of dictatorship (my personal favourite remains Marion Vargas Llosa’s The Feast of the Goat). It is to be hoped that it will lead more readers to explore Alejo Carpentier’s work. Spanish Lit Month hosts, Richard and Stu, have chosen Adolfo Bioy Casares’ The Invention of Morel as the group read title this year: a fantastic choice but unfortunately one which I have read and reviewed only recently. 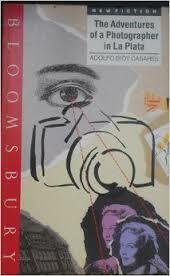 Not wanting to miss out entirely I decided to participate by reading another of Casares’ novels, the last, in fact, to be translated into English (by Suzanne Jill Levine), The Adventures of a Photographer in La Plata, which he wrote in 1989, almost fifty years after Morel. It tells the story of a young photographer, Nicolasito Almanza, who is despatched to La Plata on a commission to photograph the town. (Casares himself was a very keen photographer). He lodges with an old friend, Mascardi, but also becomes involved with a family who arrive in town at the same time as him, feeling dutiful towards the father, Don Juan Lombardo, and attraction towards his two daughters, Griselda and Julia. Is he, though, the victim of a plot against his life? Who can he trust, if anyone? Later, he is accused of sending a friend to jail; Almanza also suspects he is following him. His only worry is that the cheque he has been promised for his photographs has not arrived, a mixture of poverty and pride reducing his diet to the point that he begins to hallucinate (at least, that would be the rational explanation for the novel’s dream sequences). For the most part, like a camera, he perceives everything from the outside. When it is suggested to him that he is an artist, he says, “Only a photographer.” This might explain the gift he receives at the end, a kaleidoscope, inviting him to look at the world a different way. The Adventures of a Photographer in La Plata resists attempts to reach beyond the surface. A mystery where there may be no mystery; a love story where we are never certain of the love; the novel of a photographer, not an artist. Enrique Vila-Matas has always been a writer who writes about writers – writers who cannot write (Bartleby & Co); writers who confuse fiction and reality (Montano); writers who have not yet started to write (Never Any End to Paris) – and his latest novella to appear in English, A Brief History of Portable Literature, is perhaps his most intensively writerly yet. (This does not indicate a progression in his style – though only recently translated by Anne Maclean and Thomas Bunstead, it was first published in 1985). It features a gallimaufry of authors and other artists linked by their membership of a secret club which bears the name of that most playful of novels, the Shandies. Vila- Matas goes on, as the title suggests, to recount the society’s history in a series of brief chapters. Founded by Duchamp (and presumable inspired but Duchamp’s boite en valise, a suitcase which contained sixty-nine miniature reproductions of the artist’s work), the Shandies sojourn in a variety of literary locations around the globe, beginning on the coast of Africa, but including Vienna and Prague, before settling in a submarine named after a German railway station. While some members are ever-present most are transitory: F. Scott Fitzgerald invited to a party, accommodation in Prague sought in Gustav Meyrink’s neighbourhood, Paul Klee making dutiful notations in the submarine’s log. This can make the text feel like a veritable blitz of name-dropping, though some chapters take a little time to focus on a particular member: one deals with the origins of the stories in Blaise Cendras’ Anthologie nègre, another takes the form of a postcard from Aleister Crowley. Be warned, however, it probably sounds a lot more fun than it is (if it doesn’t even sound like fun, I would not recommend it). If Vila-Matas’ intention is simply to amuse then it’s difficult to avoid the impression that there might be three or four individuals with the requisite knowledge to find the whole thing thigh-slappingly funny but, otherwise, what might sound like a book lover’s delight is a little like offering someone with a sweet tooth a cup of sugar to munch through. 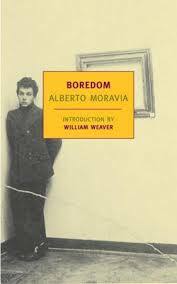 The novella is not simply a humorous skit, though, but can also be read as an imaginative essay in literary criticism. 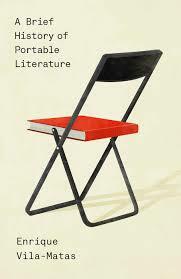 A Brief History of Portable Literature is not an ideal starting point for those unacquainted with Vila-Matas but for those of us who have already learned to love him, we can only take delight that more of his work is becoming available in English. You are currently browsing the 1streading's Blog blog archives for July, 2015.